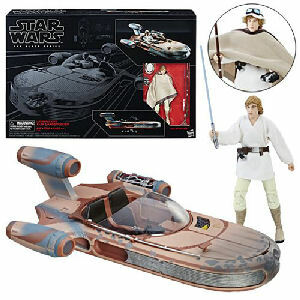 We have Just Sold out of Star Wars The Black Series Luke Skywalkers Landspeeder Vehicle with Luke Skywalker Action Figure. This Item is unavailable at present. From the Star Wars collection by Hasbro. Star Wars The Black Series Luke Skywalkers Landspeeder Vehicle with Luke Skywalker Action Figure. The X-34 landspeeder includes a clear stand for display. Action figure measure 6 inches tall and comes with charatcter specific accessories. Ages 4 and up.